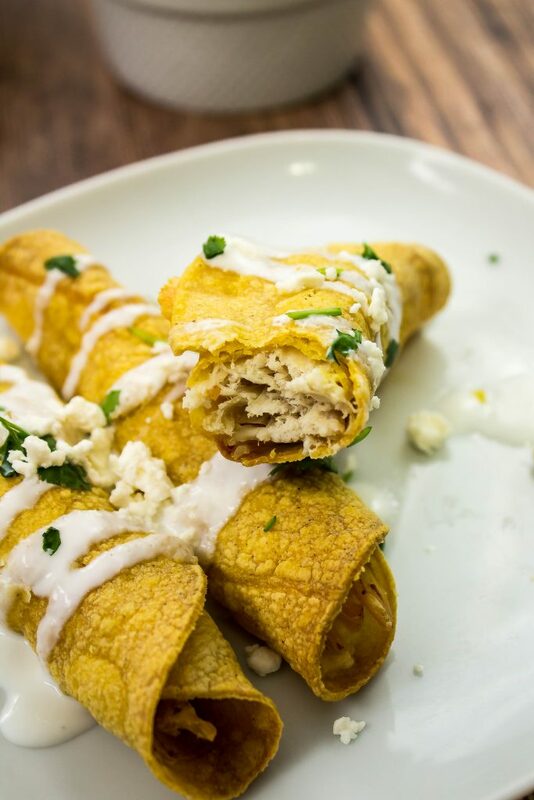 Baked Chicken & Cheese Taquitos are shredded chicken & cheese, rolled into a tortilla and baked until crispy. Great as an appetizer! Weight Watchers friendly recipe- 6 SmartPoints! Tex-Mex is by far my favorite cuisine. What is Tex-Mex, you ask? I grew up in Texas and this is what we ate. It’s a variation of traditional Mexican cuisine with dishes such as nachos, fajitas, and cheese enchiladas, to name a few. 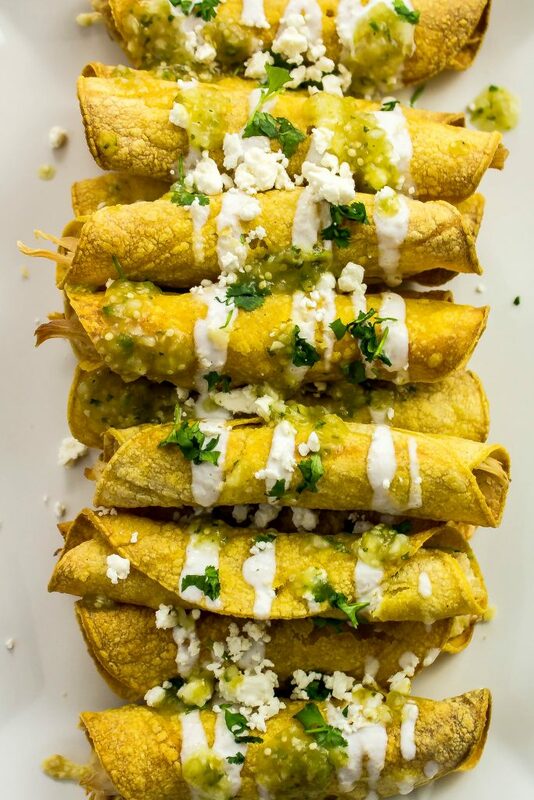 One of my favorite Tex-Mex dishes are taquitos. 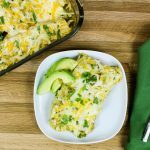 My Baked Chicken & Cheese Taquitos are delicious, easy to make, and perfect to serve as an appetizer or dinner! 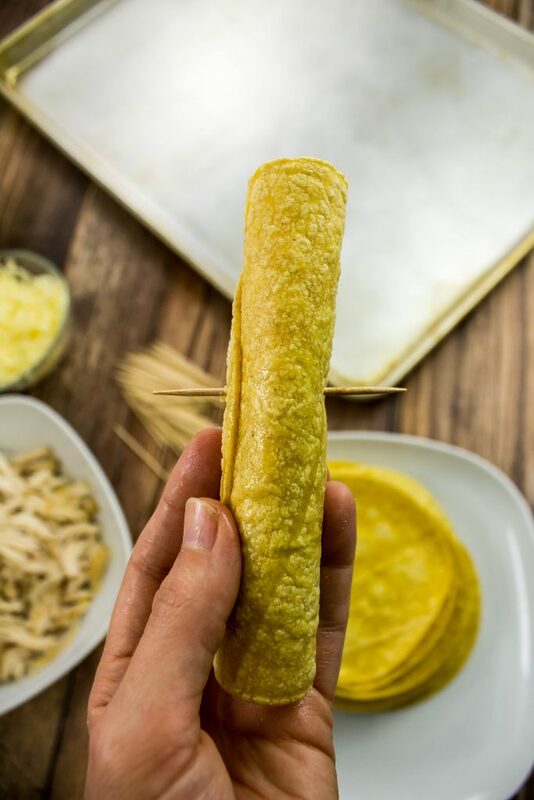 Shredded chicken & cheese, rolled into a tortilla and baked until crispy. 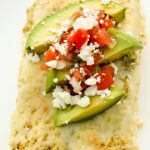 This is a Weight Watchers friendly recipe and 3 taquitos are 6 SmartPoints! 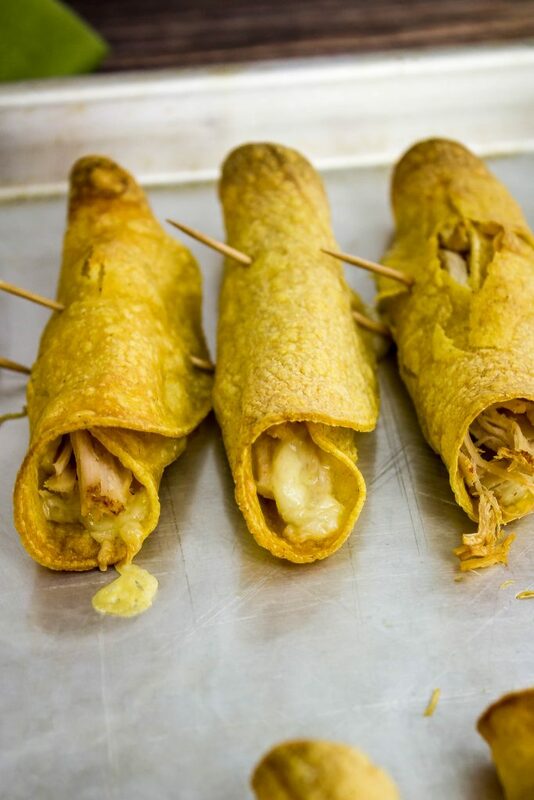 Have you ever had a taquito or a flauta? 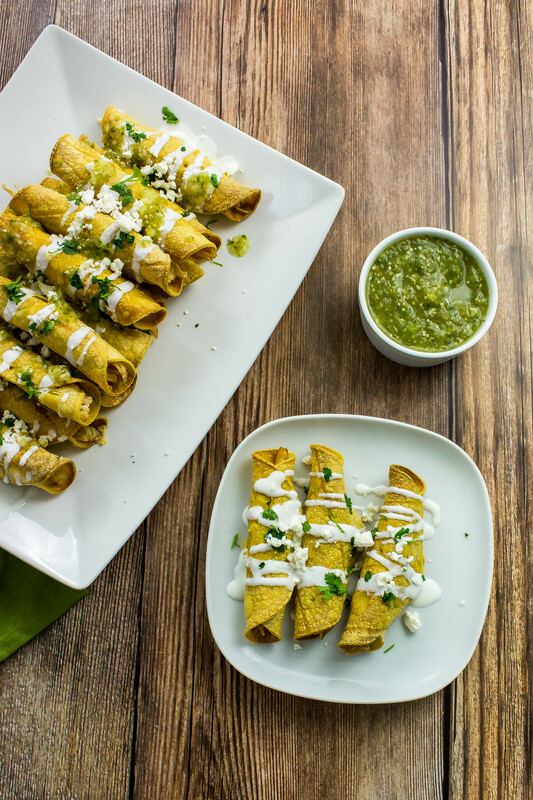 Taquitos and flautas are very similar… they are basically a rolled up tortilla stuffed with meat (usually chicken), fried until crispy, and served with dip, which sounds delicious right? The main difference between the two is the size of the tortilla. Flautas are generally made with a burrito size tortilla, and usually with a flour tortilla. Taquitos are made with a standard taco size corn tortilla, which I like better. I remember as a kid eating frozen chicken taquitos and loving them. As an adult, I think fondly about those taquitos but would rather make my own than buy the frozen kind. Making my own taquitos ensures they are healthy and without preservatives. 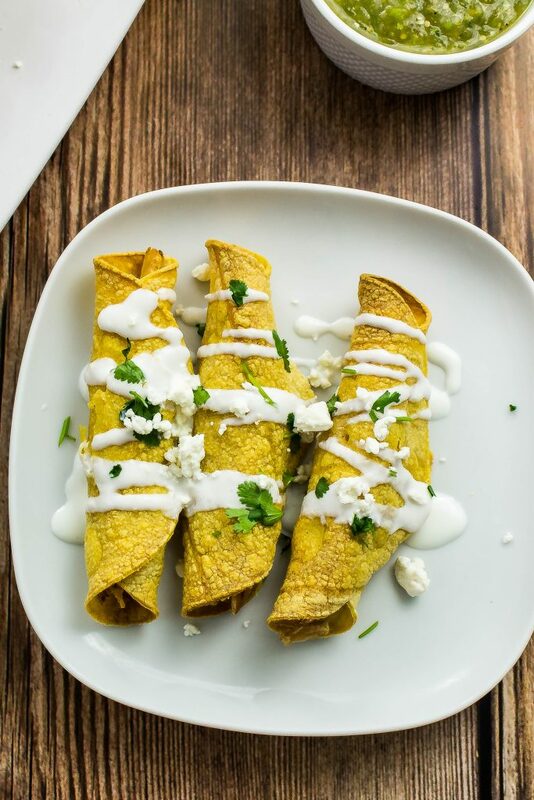 I love taquitos and never would have thought I could make these at home, especially a healthy version… until now! So how was I able to make delicious taquitos healthy? By using corn tortillas and baking the taquitos rather than frying. That’s right, I baked the taquitos and they are just as crispy as if they were fried! I bake corn tortillas all the time to make my own tostada shells and tortilla chips. I’ll be sharing my tortilla chips recipe soon so you can enjoy delicious, guilt free chips at home 🙂 . This recipe starts with shredded chicken. 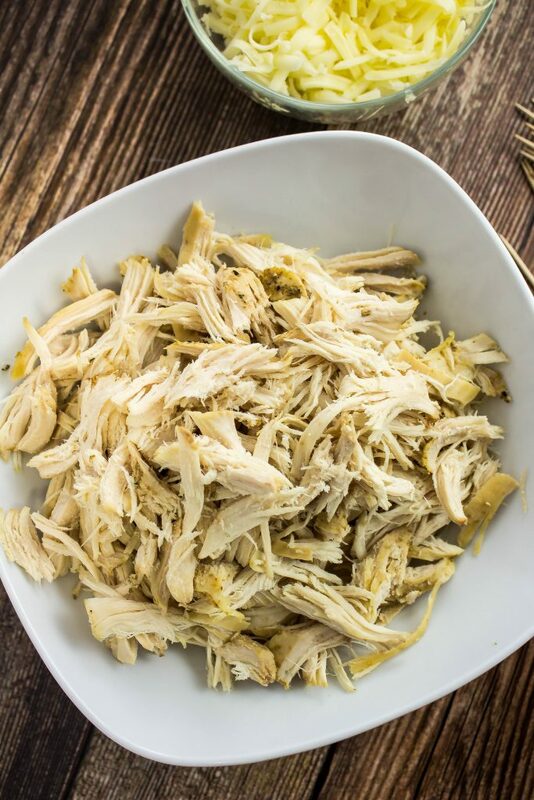 For this recipe, I make my Slow Cooker Shredded Chicken. This is my go-to recipe any time I make a dish that calls for shredded chicken. Make the chicken on a Sunday and have shredded chicken on hand during the week! After the chicken has been shredded, it’s time to get rolling! Not only do these taquitos have shredded chicken inside, by there is also shredded monterey jack cheese. 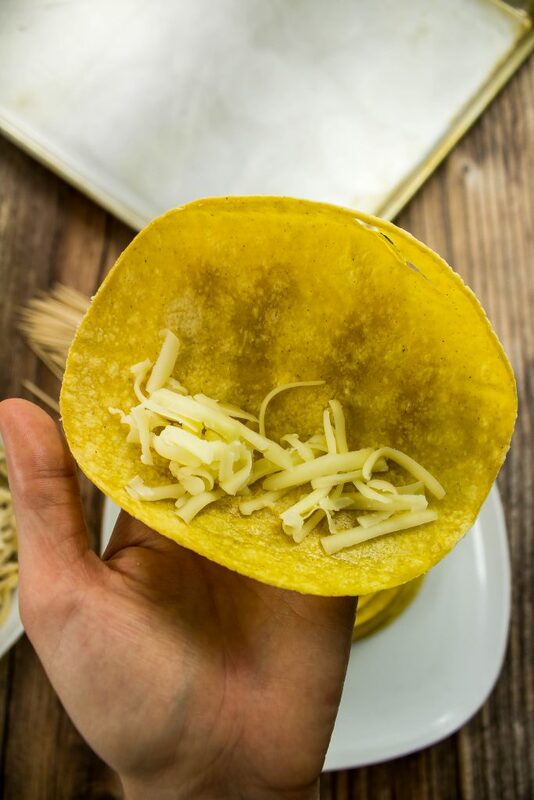 I love monterey jack cheese and this cheese adds a nice creamy bite to the taquito. 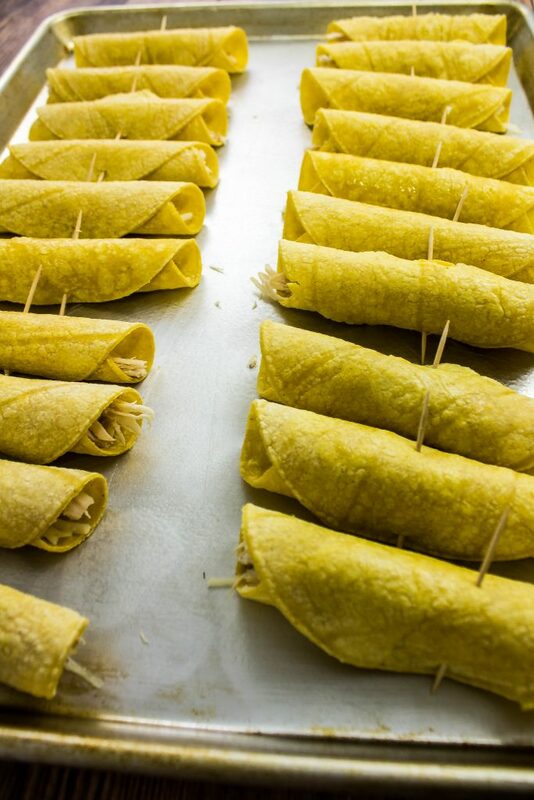 To assemble the taquitos, lay a tortilla onto your left hand and add 1 tablespoon cheese. Add 2 tablespoons chicken on top of the cheese. Roll up the tortilla tight and secure with a toothpick. Repeat the above steps 20 times. Spray a baking sheet with cooking spray and lay all the taquitos flat onto the sheet. Spray the top of the taquitos with cooking spray. 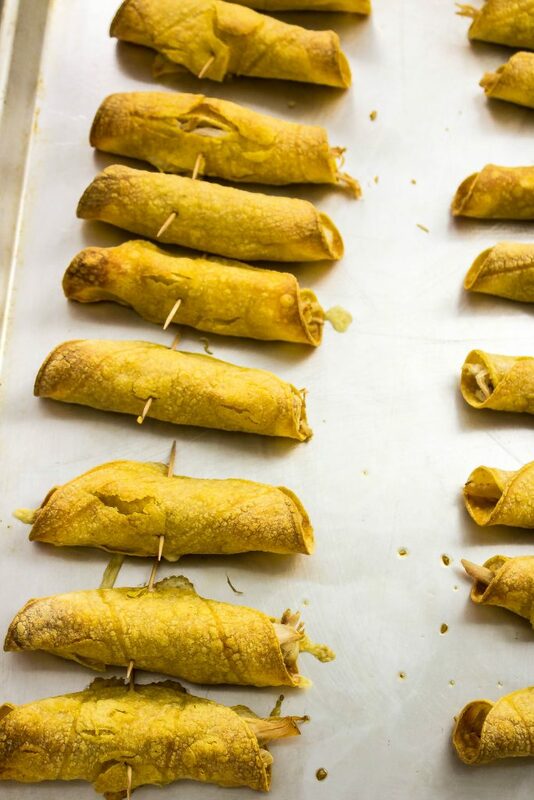 Bake the taquitos at 400 degrees for 25 minutes until golden brown and crispy. These taquitos bake to crispy perfection… you would have no idea they weren’t fried! Cheesy, packed with delicious shredded chicken, and easy to make. I like to serve my taquitos with my Roasted Tomatillo Salsa. 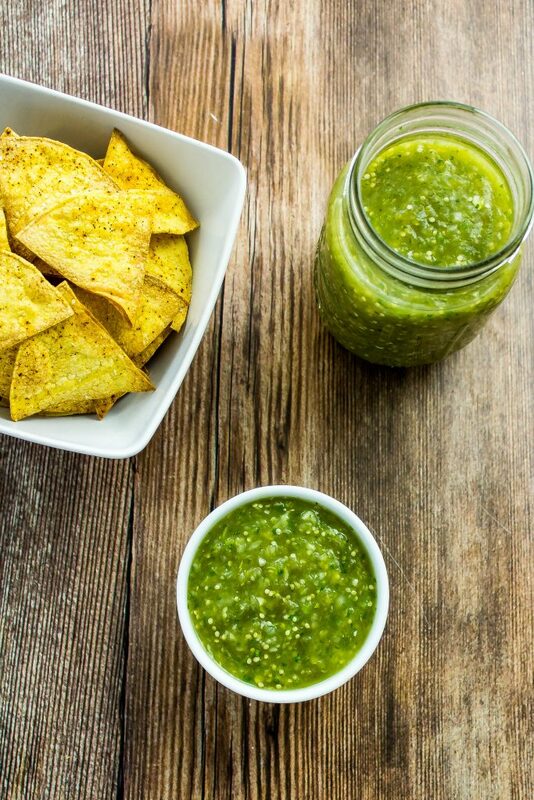 This salsa is the perfect dip for these taquitos. Fresh, easy to make! To make these extra fancy, drizzle some fat free sour cream on top with a sprinkle of fat free feta cheese and cilantro. Baked Chicken & Cheese Taquitos are delicious, easy to make, and perfect to serve as an appetizer or dinner! Shredded chicken mixed with tomatillo salsa and cheese, rolled into a tortilla and baked until crispy. Eat a few as an appetizer, or make it a dinner! 6 Weight Watchers SmartPoints for 3 taquitos! 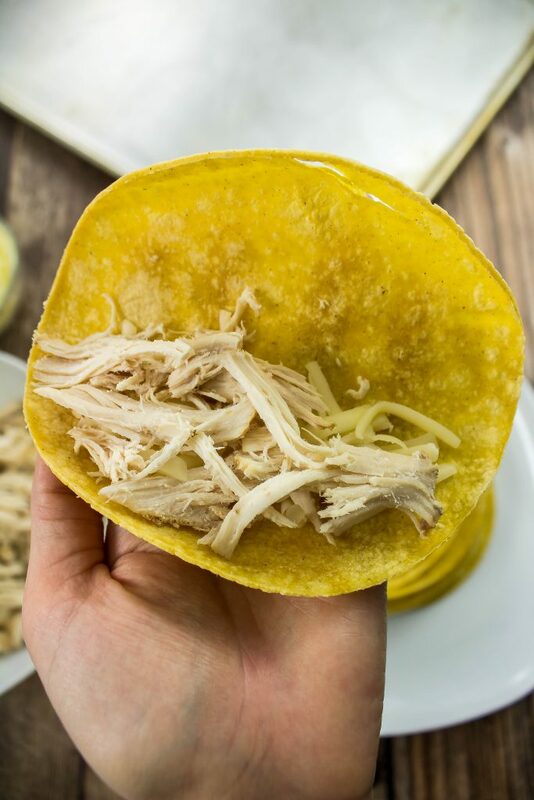 Make Slow Cooker Shredded Chicken according to recipe instructions. 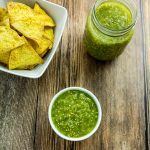 Make Roasted Tomatillo Salsa according to recipe instructions. Spray both sides of tortillas with nonfat cooking spray and place in a ziplock bag. Microwave 40 seconds. This will help the tortillas be flexible for stuffing. 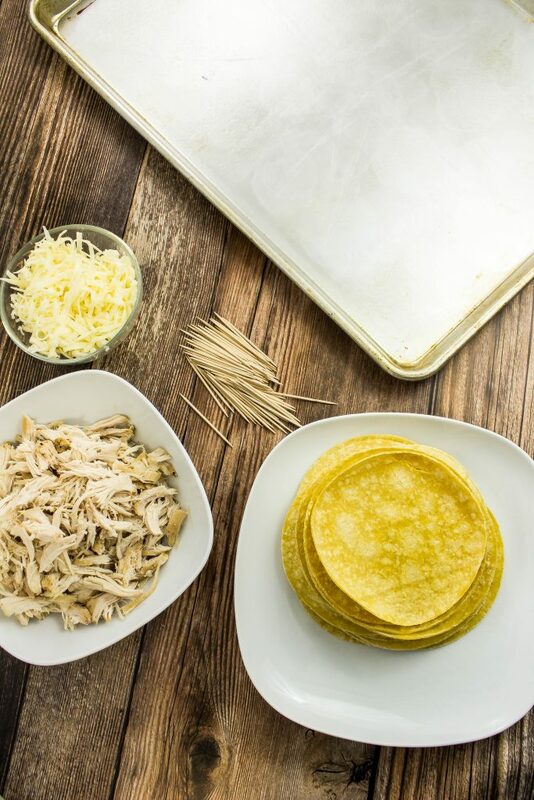 Lay tortilla in one hand and add 1 tablespoon cheese then 2 tablespoons of chicken into the center of the tortilla. Roll tortilla up tight and secure with 1 toothpick in the center closing the seal of the tortilla. Lay taquitos on baking sheet in even layer. Spray tops of taquitos with cooking spray. Rotate baking sheet and bake for another 10 minutes until taquitos are golden and crispy. Make a large batch of taquitos and freezer for later! Nutrition is based on the NEW Weight Watchers Freestyle Program guidelines. Nutrition calculated using Weight Watchers calculator. July 20, 2017 at 2:11 pm Yummm! I'll be pinning this one! July 25, 2017 at 3:27 pm Thank you for pinning Andrea :)! July 20, 2017 at 2:22 pm These taquitos look so delicious and easy to make. I cant wait to try them! July 25, 2017 at 3:26 pm It's whats on the inside that counts ;) Thanks Taylor! 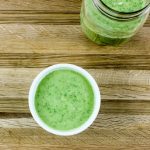 July 21, 2017 at 12:53 am This looks like such a yummy and easy recipe. Thank you for sharing, can't wait to try it. July 25, 2017 at 3:25 pm They are delicious and easy... winning combo! Thanks Cassidy!! July 21, 2017 at 10:39 am These look so yummy and easy to make! I love Tex-mex, I'm going to give this a try! Thanks for sharing! July 21, 2017 at 11:17 am Yummy! I love finding new ways to use rotisserie Chicken and this is perfect. July 21, 2017 at 11:19 am These look SO DELICIOUS!!! I cannot wait to try them, I've been looking for a recipe like this! Yum! July 21, 2017 at 1:06 pm These look SOOOOOOO good! I cannot wait to make these! July 21, 2017 at 2:29 pm I love taquitos! But baking them sounds so much healthier! I can't wait to try these for dinner! July 21, 2017 at 5:10 pm These taquitos look so good. Love that you've baked them instead of frying. That tomatillo sauce sounds amazing, and kudos to you for getting those corn tortillas to hold together. Lol! Mine also tear to shreds. July 21, 2017 at 5:13 pm Not sure what looks better? The Taquitos or the salsa???? So pinning both!!!! July 21, 2017 at 7:40 pm This post made me seriously hungry!!!!! These tacos look sooooooo good!!! I think I will be making them tomorrow for dinner :) Thanks for sharing! July 25, 2017 at 3:20 pm Oh thanks Andrea :)! July 21, 2017 at 10:34 pm Corn tortillas make all the difference when it comes to taquitos, but the filling sounds like it'd make some awesome burritos too! July 22, 2017 at 12:01 am I love this idea! We normally pan fry taquitos so Im excited to try this baked version! July 22, 2017 at 9:41 pm These look SO delicious! Definitely trying this out sometime! July 25, 2017 at 3:18 pm I hope you do!! July 23, 2017 at 2:01 am Oh man!! These look so yummy! My husband's favorite food is Mexican/Tex Mex, so I definitely should incorporate these into our dinners! July 25, 2017 at 7:11 pm These look INSANELY delicious. I can't wait for my husband to get back from his business trip so I can test these out on him! July 27, 2017 at 4:50 pm They ARE insanely delicious :) I hope he gets back soon so you can get to making these Caitlin!! July 31, 2017 at 9:51 am They ARE so good!! August 2, 2017 at 6:22 pm Taquitos are so good, especially made at home! !